Ben Zobrist was acquired by the Kansas City Royals from the Oakland Athletics on Tuesday. It wasn’t long ago that a career .265-ish hitter with some pop and a versatile glove was destined for cult status. (Think Ty Wigginton or Fernando Tatis.) And in a way, I suppose Ben Zobrist, whom the Kansas City Royals acquired Tuesday from the Oakland Athletics with an eye on Friday’s trade deadline, has achieved just that. But here’s the twist: The denomination that worships Zobrist most is the Church of Sabermetrics — coincidentally, a movement that has essentially taken over baseball in the past decade-plus. And that makes Zobrist a fascinating case study in how the right player with the right metrics at the right time can be elevated to stardom. There was little about Zobrist’s early career that suggested breakout potential. He didn’t make his major league debut until he was 25 years old, a good six years later than the Mike Trouts and Bryce Harpers of the world. Drafted out of college with the 184th overall pick in 2004, Zobrist hit well in the minors1 but was older than his peers at almost every stop along the way. He certainly never made any top prospect lists and did little to impress in his first two MLB seasons. And although he flashed signs of potential — an .844 OPS (on-base plus slugging) with good power — as a part-time player during the Tampa Bay Rays’ magical 2008 World Series run, Zobrist wasn’t a major league regular until the following season, at age 28. All he did that season was lead the American League in wins above replacement (WAR).2 Then, two years later, he did himself one better, leading the entire majors. Over the 2009-12 period, he topped all major league position-players in WAR. Before the 2013 season, you could have made a case — on the basis of sabermetric statistics, at least — that Zobrist’s name belonged on the list of candidates for Best Player In Baseball, perhaps even at the top. WAR is Zobrist’s best friend, its modular nature being well-suited to detecting the strengths of Zobrist’s well-rounded game. Given Zobrist’s versatility, it’s no surprise that he fares best in a holistic metric whose components range from batting3 to baserunning, double-play avoidance, fielding quality by position and — perhaps most importantly — positional scarcity. 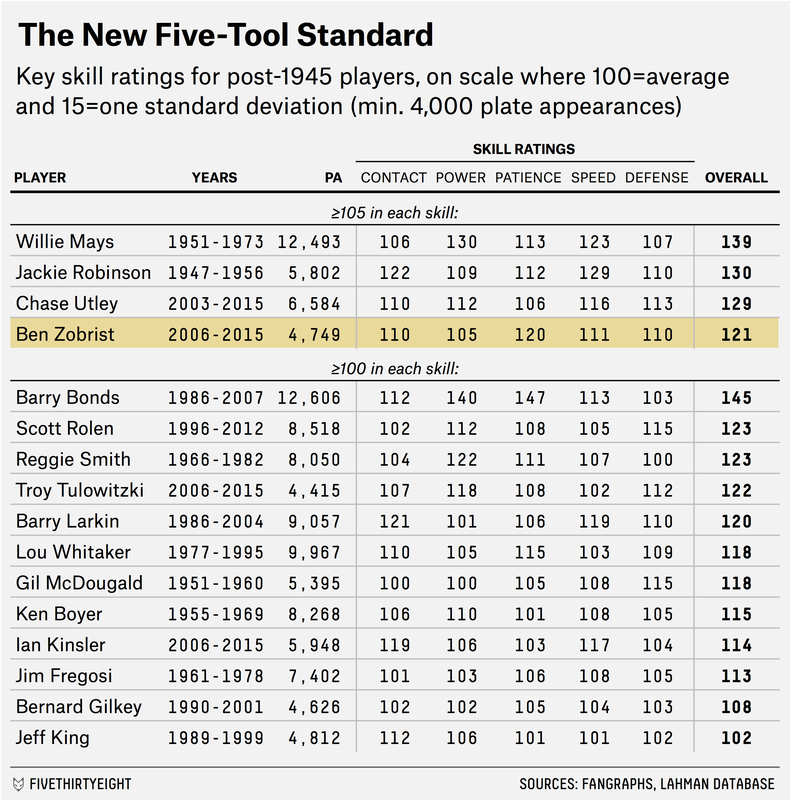 Traditional forms of evaluation don’t properly appreciate a player like Zobrist. Even in his most valuable years, he hit just .268 with about 20 home runs and 85 RBIs per season. But with the growth and mainstream acceptance of sabermetrics, Zobrist came along at the right time for his particular mix of skills to be both comprehended and acknowledged. His career minor-league OPS (on-base plus slugging) was .885. Which uses Weighted Runs Created Plus (wRC+), that most advanced creature in the evolution of hitting metrics, as its basis. Measured, respectively, by strikeout rate, isolated power, walk rate, speed score and defensive WAR.